Today, the name A.E. (Arthur Edmund) Seaman is well-known in the Copper Country, largely for his close ties to the Michigan Technological University and for the mineral museum along Sharon Avenue in Houghton that bears his name. Born in Casnovia, Michigan on December 29, 1858, Seaman was a graduate from Michigan Tech, having earned his B.S. degree in 1895 at the age of 37. 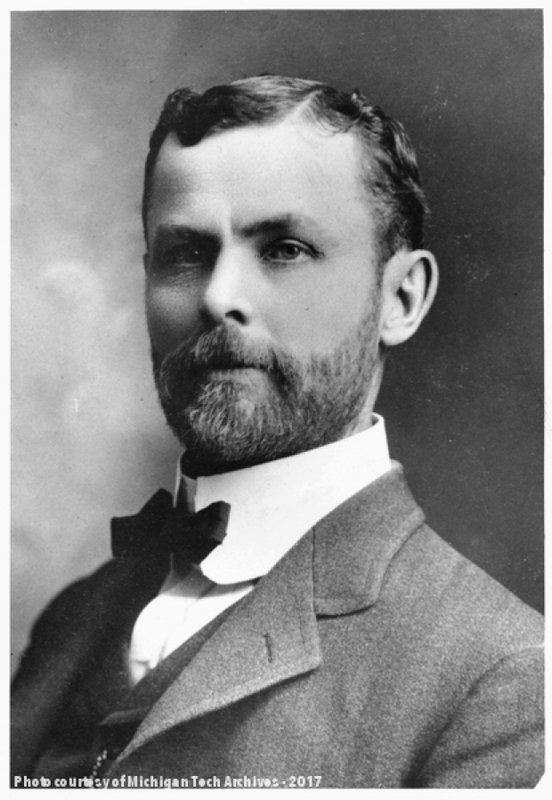 Seaman later became a full professor in the Department of Geology and Mineralogy and was a noted authority on the pre-Cambrian geology of the Lake Superior region. Among his contemporaries, he had a reputation for having a wider, first-hand knowledge of the geology of the Lake Superior region than any other man. Seaman retired in 1928 with the title of professor emeritus of mineralogy and geology, but was made curator of the mineralogy and geology museum, which was then housed on the third floor of the college’s new engineering building. According to the 1928-1929 Bulletin of the Michigan College of Mining and Technology, the collection was “unusually complete” and “famous for its well arranged and complete assortment of rocks and minerals from all parts of the world.” The museum was renamed in Seaman’s honor in 1932 as the A.E. Seaman Museum, later renamed to the A.E. Seaman Mineral Museum and moved to its current location along Sharon Avenue. Peace With Justice, Daily Mining Gazette, November 17, 1918. While Seaman’s contributions to the field of mineralogy and to Michigan Tech, a relationship he maintained until his death in 1937, cannot be understated, what is less widely known is the personal side of this important figure within the Copper Country. His granddaughter, Jeanne Seaman Farnum, described Seaman as being, “known as a kindly gentleman with a bubbling sense of humor” with “a habit of being cheerful.” A man of a seemingly friendly nature and genuine concern for his students, Seaman was a softhearted man of many talents. Among his non-academic interests was his penchant for writing poetry, something that he shared with family, friends, and students alike. 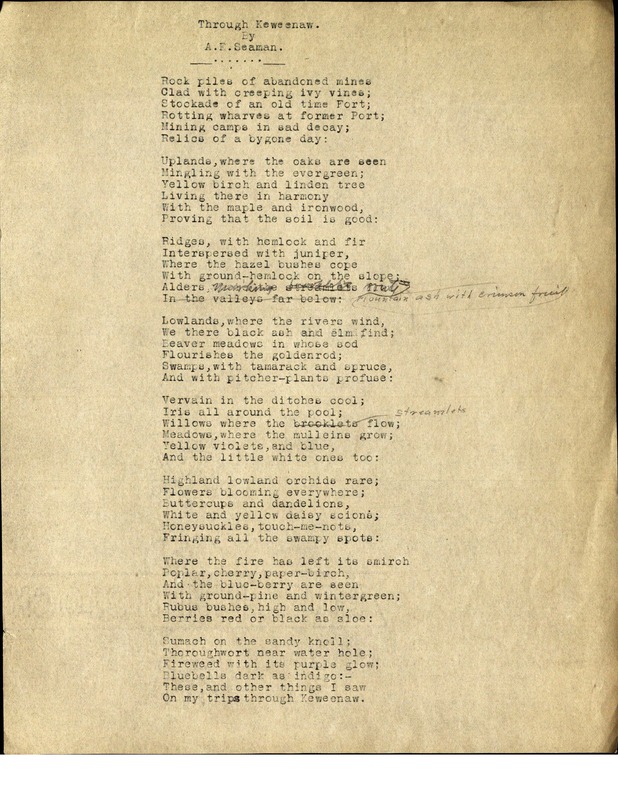 His poem, Peace with Justice, published in the Daily Mining Gazette on November 17, 1918 just days following the armistice is a reflection on the costs of war. 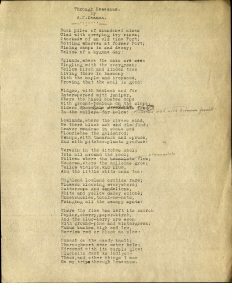 Several of Seaman’s poems scattered throughout speak of war, freedom, sacrifice and patriotism, issues common throughout the country at the time. These were obviously themes that weighed heavily on his mind as well. His poem Cootie, The Mascot, however brings a tinge of humor to his World War I poetry, in his ode to the tiny lice that plagued so many of the men in the trenches. Indeed, the bulk of his poems to reflect the landscape, heritage, and natural beauty of the Keweenaw. References to the mining industry, local plant and wildlife, as well as geological makeup of the land permeate his poems. Poems in the collection reflect his interests in geology and history such as his poems Down The Ages, Dinosaurs, or Stories Of The Rocks, which directly reflect his interest in various geological eras and the beasts that occupied the land long before man. Seaman wrote, at least in part, about his personal experiences. His poem My First Discovery (Idaho, 1899) chronicles his discovery of gold out west and subsequent digging where he “worked until the perspiration filled my/eyes and made me blind-/worked and toiled with muttered cursings-/no more colors could I find.”. 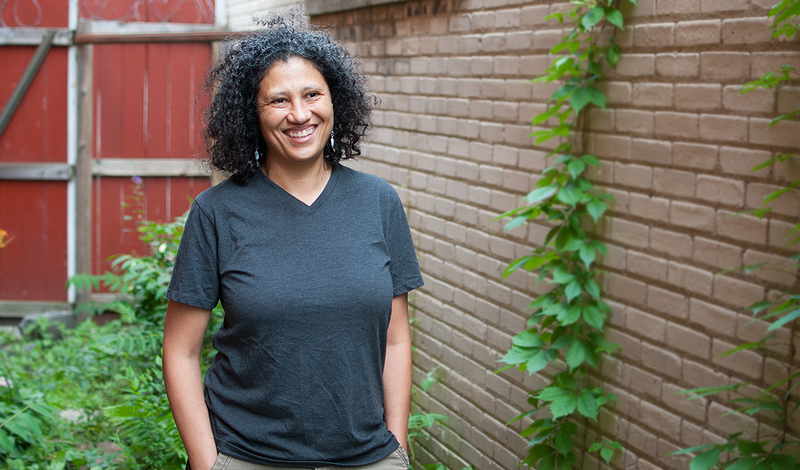 It’s unclear whether the poem is biographical, thought the title does suggest it, or merely a musing on the feverish feeling of a first time discovery. However, read within the larger context of the mining history in the Copper Country Seaman’s poem speaks volumes to local mining tradition. A.E. Seaman was a man of many talents and interests. 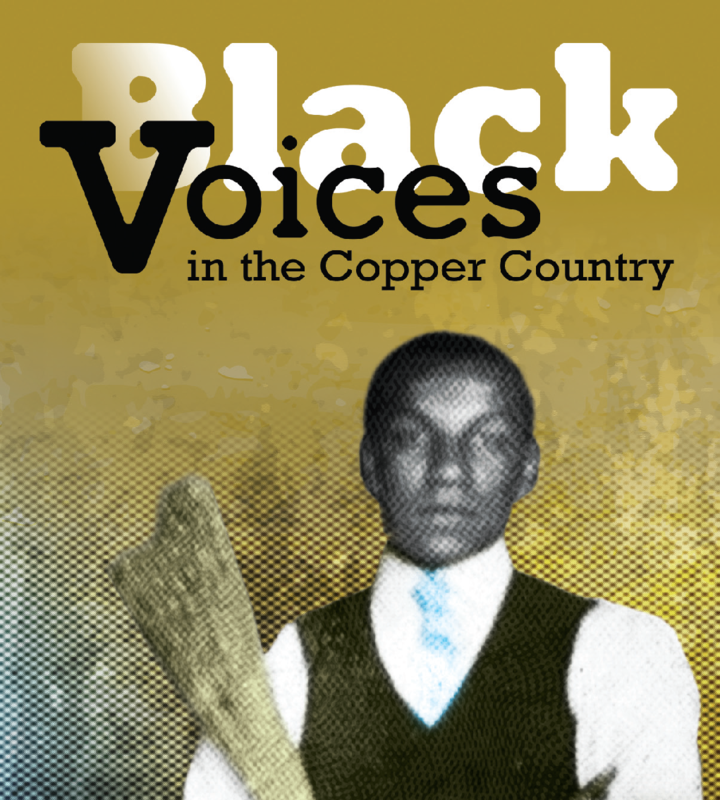 His poetry may never be revered in the same way as Shakespeare’s, but it represents a fascinating layer to a man well-known in the Copper Country for his other achievements and one that provides a glimpse into the personal side of a very public figure. You can view more of A.E. Seaman’s poetry in the Seaman Family Collection as well as in the semi-published compilation of his work, Reminiscence of an Old Prospector, at the Michigan Technological University Archives and Copper Country Historical Collections. 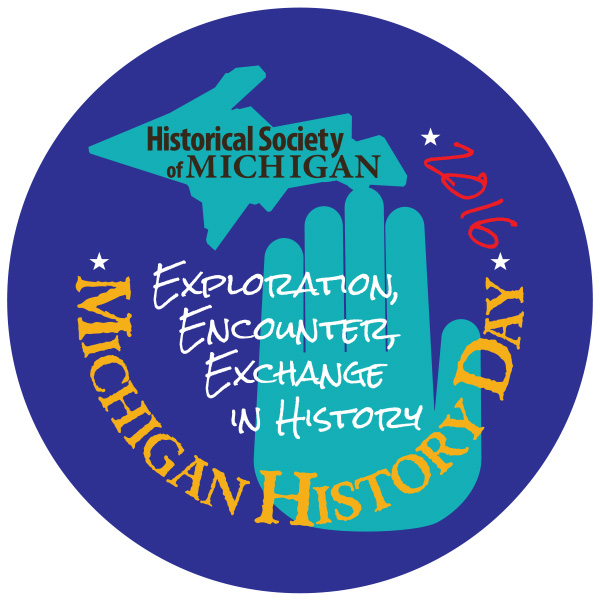 The Michigan Technological University Department of Social Sciences and the Michigan Technological University Archives and Copper Country Historical Collections are pleased to announce that the Michigan History Day district 1 competition will be held at the Memorial Union Building at Michigan Tech, Saturday, February 20, 2016 from 9am to 1pm. Five secondary schools from MI-District 1 (the 6 western counties of the UP) will be sending nearly 100 students with over 40 History Day projects to Michigan Tech for a district competition. Top entries in each category — exhibits, documentaries, websites, papers, and performances — will be eligible to go to State competition in April. Winning entries will also be on display in May at the Carnegie Museum on Houghton. History Day is a competition for middle and high school students who develop historical research projects based on an annual theme that highlight people, events, and ideas in history. This year’s national theme is “Exploration, Encounter, Exchange in History” and projects are on local, state, national, and even world history. 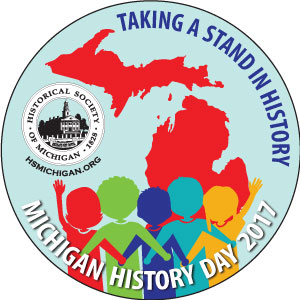 Michigan History Day is sponsored and coordinated by the Historical Society of Michigan, which coordinates 13 state districts. Each school in the district has initial competitions and sends up to three entries (individual or group) in each category to a district competition, which then sends on top projects in each category to state finals in May. ABOUT MHD-district 1: Assistant Professors Steven Walton and Jonathan Robins, both historians in the Dept. of Social Sciences, and Senior Archivist Lindsay Hiltunen of the Michigan Tech Archives are the coordinators for Michigan District 1 (Houghton, Keweenaw, Baraga, Ontonagan, Iron and Gogebic counties). The Department of Social Sciences offers a B.A. degree in history with particular strength in industrial and environmental history and archaeology. The Michigan Tech Archives holds unparalleled historical resources on the Copper Country and its mining history. Michigan Tech has been hosting the district conception each February or early March for nearly a decade.